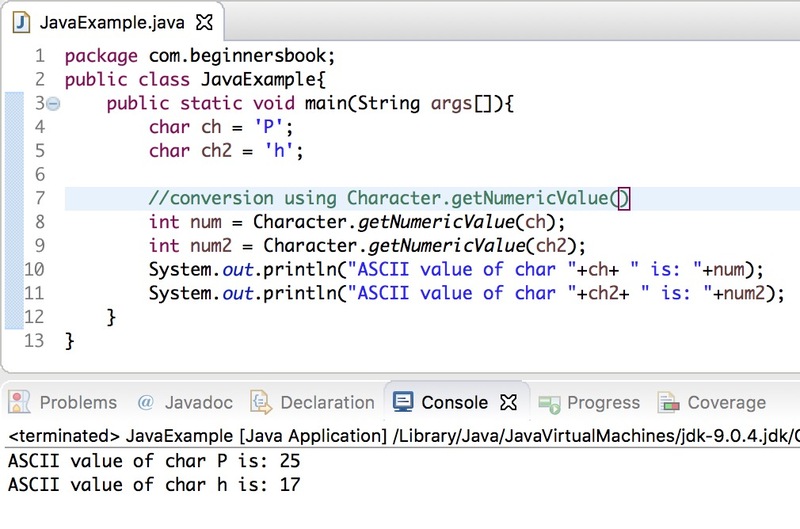 In this tutorial, we will see how to convert a char to int with the help of examples. Converting a character to an integer is equivalent to finding the ASCII value (which is an integer) of the given character. Since char is a smaller data type compared to int, thus we do not need to do explicit type casting here. A simple assignment of char value to an int variable would do the trick, compiler automatically convert the char to int, this process is known as implicit type casting or type promotion. In the following example we are assigning char values to integer variables without any typecasting. Compiler automatically doing the conversion here, this only applies when we are assigning a smaller data type to larger data type else we have to do explicit type casting. 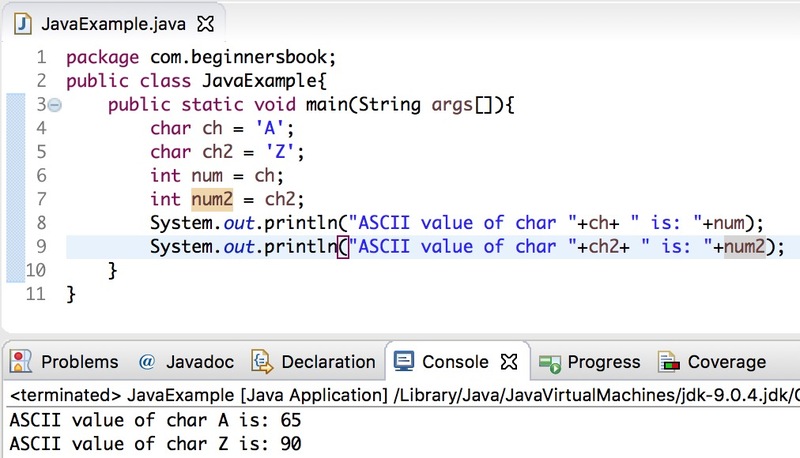 We can also use Character.getNumericValue(char ch) method to convert a char to an int. This method accepts char as an argument and returns equivalent int (ASCII) value after conversion. Here we have two char variables ch and ch2 and we are converting them to integers num and num2 using Character.getNumericValue() method. 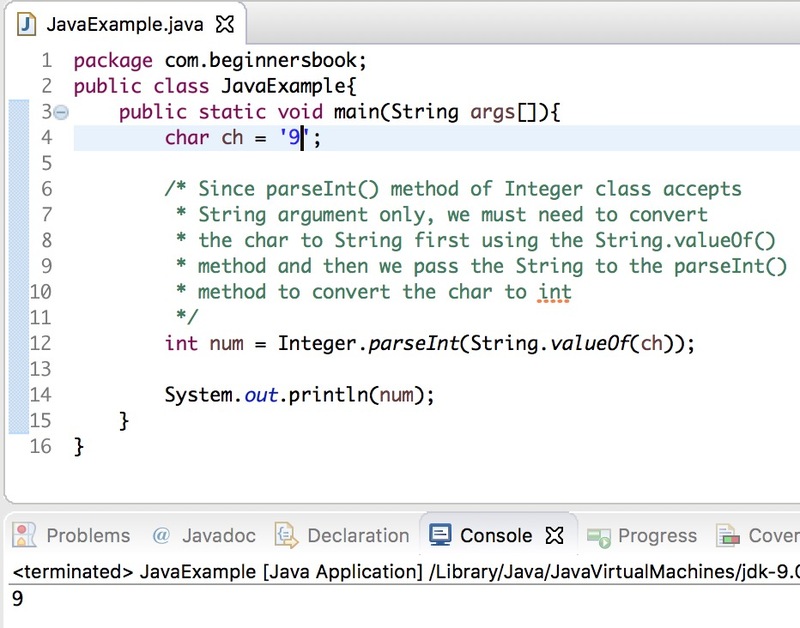 Here we are using Integer.parseInt(String) method to convert the given char to int. Since this method accepts string argument we are converting char to String using String.valueOf() method and then passing the converted value to the method.